I was lucky enough to be sent The Potion Diaries and Royal Tour to read when Amy released Royal Tour. Since I knew there was going to be a third one as soon as it was available I pre-ordered it and then when it came through my door, I completely devoured the final instalment within a four-hour work shift (I was allowed it's all good). Having managed to find her great-grandmother's potion diary, escape Emilia Thoth, save her grandfather's memories AND become a Master Alchemist, surely it's time for Sam to have a good, long rest? And maybe, just maybe, a date with her boyfriend Zain? Firstly, I just want to say that this cover is RIDICULOUSLY beautiful. 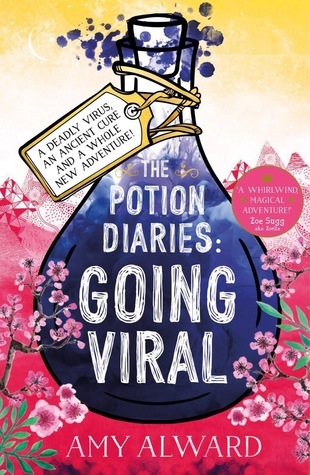 I loved the style of all the Potion Diaries covers. The colours and style is a perfect combination. This series continues the story of Sam Kemi, Master Alchemist. I absolutely love Sam as a character, she's so determined to learn and prove the truth about the deadly virus spreading through the world. All the characters in this novel were effortlessly portrayed and I could see them clearly in my imagination. I have to say the visual image I got of Zhongou and the mountain was super vivid. The adventure Sam and the gang go on throughout this novel was lovely. I'm not sure if there is going to be another one but honestly, this series is super. Overall, this book was a super easy read, full of good fun and exciting turns. 100& Reccomend this book! *this is an affiliate link and if you use it I will gain a small commission from the sale.